For added convenience, the dresser drawers built in to Nina’s House may be opened and closed with “a slight push of the knee,” so caregivers can keep their hands free to secure baby on the changing table stationed above. 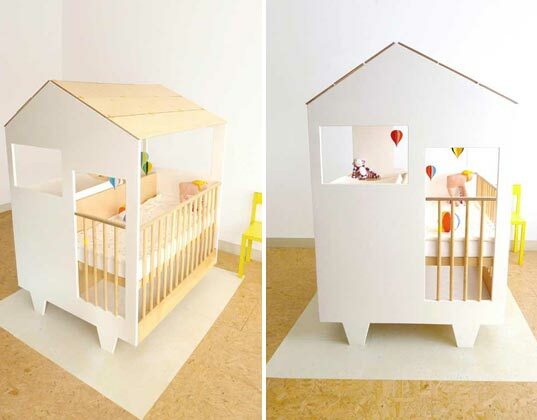 Window cut-outs give mom and dad a bird’s eye view of their little one playing or slumbering, and the roof may be rolled back and removed if desired. The plywood haven sits atop two wheels, making this mobile home easily transportable. 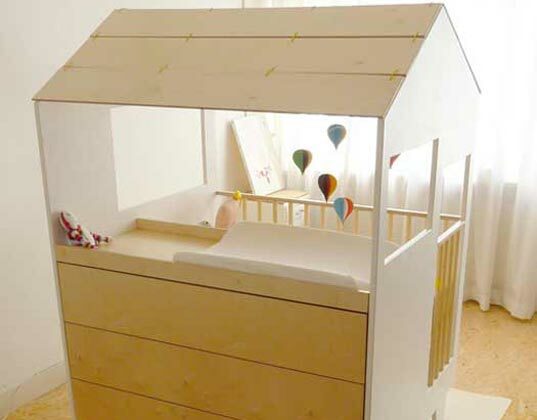 As baby grows, the base of the house may be lowered, and the rails may be removed to create a toddler bed. Dutch designer Dave Keune answers many a parent's decor dilemma by placing multiple pieces of baby furniture under one roof in Nina's House. The miniature abode combines a crib, playpen, dresser and changing station to streamline all of the necessities that baby requires upon homecoming. Keune explains his charming innovation is, "A house within a house, a room within a room. Nina�s House was created out of the need for a separate space for a newborn, without having to renovate or move house entirely."